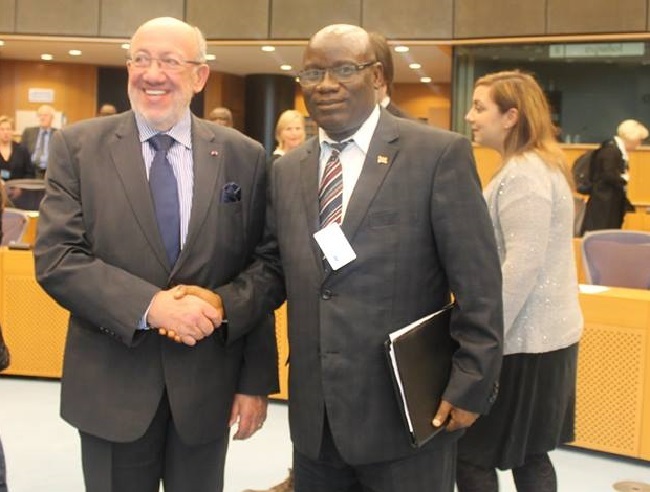 Liberia’s Ambassador to Belgium,the Netherlands, Luxemburg and the European Union, Isaac W. Nyenabo has called on African ambassadors and diplomats working in Belgium to remain supportive of all programs of the continent. Ambassador Nyenabo said African diplomats must begin to galvanize support and mobilize resources that will help in the development of the African continent by promoting growth. He said African diplomats have key roles in ensuring that they be true representation of their people in an effort to see the continent uplifted, thus pullling its people out of poverty and spurring economic and infrastructural development on the continent. The Liberian diplomat made the remarks separately when he was on April 17 inducted as one of the newest members of the West African Ambassadors, the African Union Group of Ambassadors, the African Carribbean Pacific Ambassadors and the African Carribbean Pacific Ambassadors at the European Union during the week. The West African and the African Union Group of Ambsassadors comprises sixteen (16) and fifty-two (52) representatives respectively while the African Carribbean Pacific Ambassadors composed of fifty-two (52) Ambassadors. The African Carribbean Pacific Ambassadors at the European Union is made of representatives from seventy-nine (79) countries, fifteen organizations and twenty-eight(28) European Union Countries. Ambassador Nyenabo said Liberia made tremendous gains before the outbreak of the Ebola virus disease and added that the outbreak has had an adverse impact on the country’s economy. He called on friendly countries to support the country’s post-Ebola recovery program. He said Liberia’s post-Ebola recovery plan will require regional and international support, adding that the country has not experienced any new case of Ebola for over three weeks now.